The Gran Centenario añejo (Gold Label) tasted is a pre-difusor tequila. Reviewed December 2010 from a freshly opened bottle. 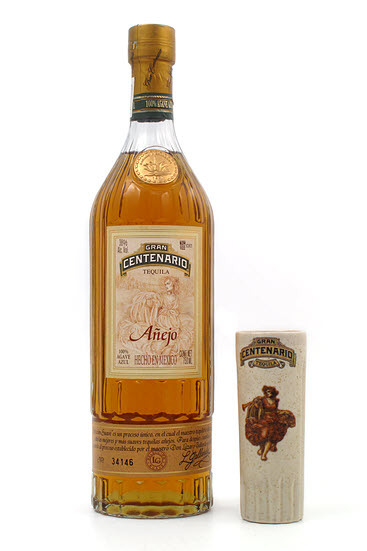 Tasted from a red wine glass, this tequila is golden orange in color with thin slow legs. It is very mellow and it does not have any alcohol or barrel burn on the nose but has plenty of vanilla and citrus tones. A relativly thin mouth feel, the taste starts off very woody that turns citrusy and spicy with vanilla and bitter dark chocolate overtones. A very long finish that finally reveals its earthy agave origins. This is a very tasty tequila, so if you can find a bottle, get it, becuase this is some really good stuff! !